When making big decisions such as whether or not to get the kids a dog or which Court Reporter Firms should I hire? I pull out my trusty legal pad, score a line down the middle with my needle-sharp Dixon Ticonderoga No. 2 pencil and quickly scrawl a pros & cons list. WHY HIRE COURT REPORTER FIRMS AT ALL? Finding a court reporter can be a daunting task. Let me rephrase that: Finding the right court reporter can be harder than it needs to be, especially if you’re deposing a witness in a remote or obscure location. Sometimes we’re left with whoever is nearest and available. If you don’t think this is an issue, you’re lucky you haven’t come across this obstacle yet. For the rest, there are solutions. There are real-time-ready, video streaming enabled court reporting solutions you can book through reputable court reporter firms. That leads us to the next search, how do you know you’re getting the best court reporter firms google has to offer? By the time you’ve tracked down the court reporter firm, you might as well have gone out and found yourself a qualified court stenographer, right? Not exactly. Put the work in to find the right Court Reporter Firms now, and you’ll never have to search for a qualified court reporter again. One click, done. As we have established, finding an experienced court reporter is time consuming and limiting. Court Reporter Firms make the process streamlined and easy. With a few simple clicks on the internet, we can now take the guesswork out of finding a court reporter. Ease of mind knowing you have working for you, individuals who are experts in hiring the right court stenographer for your case. Various court reporting firms such as Discovery Litigation Services will handle all of the coordinating, scheduling, and live-streaming tech for you. It has actually made life easier by increasing the quality. That’s a rare occurrence. The “Fast - Cheap - Good” triangle is obliterated in this instance. Yes, we can have it fast, of good quality, and cheap thanks to these video streaming enabled court reporter services. Court Reporter Firms will live stream a highly qualified court stenographer to any location. Distance nor geography are an issue to getting the right professionals for the job. There is just no excuse anymore for friction. Using, for instance, Discovery Litigation Services’ streaming court reporter solutions will enable you to get the most qualified individual for the job, experienced in a wide range of case sizes. Too often technology has been turned into an opportunity to thrust too much work and unrealistic deadlines onto a single individual. Remember back to a time when your work ended when you left the office. Whether or not it was on your mind, you didn’t have people calling your house phone to throw another task on your plate. The phone didn’t make a sound after 9:00 pm unless there was a family emergency. There was time to be human. With the ease of instant communication comes an increase in the frequency of communications, but technology has done a poor job in providing the tools to handle the newfound workloads. With Court reporter firms and their wide-ranging litigation solutions, that extra work can be taken off of your to-do list. With more time, you can spend more time doing the other things good and right, while saving time for those in your life who matter. For me, it is very important anytime I hire individuals to do work, that they understand we are embarking upon a relationship that will last as long as I am using their services. Too often you’ll yourself slipping through the cracks and not receiving the quality of service everyone deserves when parting with their hard-earned dollar. The size of a company is no excuse for being treated like a faceless robot dispensing cash in exchange for products or services. We have come to this point for a solution to very wide-ranging and specific needs. At least for me, it is important that my litigation services agency - whether hiring a court reporter or legal videography services - be as cordial and interested in what makes my needs slightly different than yours to better provide tailored solutions as the mom-and-pop seamstress shop down the street. The quality of work can suffer if you don’t have the right individuals working on your behalf. Many large companies will cookie cut solutions and try to fit every prospective client into that same mold. This may work for some, but it does not make for a long and lasting relationship. I want to be able to trust that I can hand over crucial aspects of my case to seasoned professionals who are going to do a better job than I am. Court Reporter Firms should do more than just that. Some depositions require more solutions than others, and it does not make to spread yourself across ten different companies. I am looking for litigation solutions that can be held to the highest standard and delivered without issue. I want all of my needs satisfied under the same roof. A la carte solutions are great, but when I need more comprehensive services, I need to know I can have that covered as well. Each and every experience is unique, but rest assured not every litigation services company will surprise you with hidden fees and bloated budgets after the fact. Bleeding you or your clients dry does nobody favors in the end. Too many companies feel it is acceptable and "business as usual" to inflate budgets and keep their clients in the dark until the bill comes. They will demand payment then cut off communication and refuse to explain the charges on each line-item. That’s unfathomable to me. In your research of Court Reporter Firms and various litigation services agencies, you’re going to find a number of “bad apples.” Do not let that discourage you. Set your requirements before you begin your search and don’t waver on quality. Don’t compromise because with everything in business and life, you only get as high of quality as you set your standards. A Checklist For The Right Court Reporting Firm. Experience with catering to clients, transparency in billing, and forthright communication as to what I am paying for shouldn’t be considered going “above and beyond”. That should just be how business is done. That’s how it is done here at Discovery Litigation Services. Work with those who can guarantee their services. Look for experienced professionals with a track record of excellence and customer service. For instance, Discovery Litigation Services is founded by a seasoned court reporter who thrives on delivering the best quality and the right solutions to meet the needs of the clients. 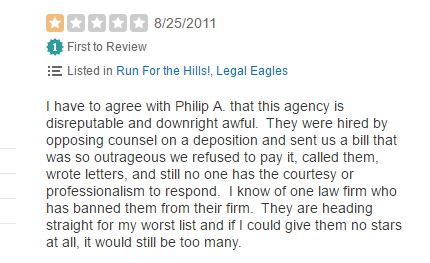 This is the culture that is expected and upheld by Discovery Litigation Services and all of our legal professionals. For me, it is always important to have that one-on-one relationship with those whom I hire. However, it is not always the case that you will have the inclination to be in constant communication with your litigation services company. Sometimes you want to set it and forget it knowing that you are in good hands and that everything you need will be delivered on time - or perhaps somewhere in between the two. Look for professionals who can offer you the level of relationship and communication that is essential for your individual needs. Encountering someone who spams your inbox and blows up your phone for the most minute details can make you wonder why you aren’t just handling the job yourself. Conversely, a company that ghosts you after you schedule a deposition can be nerve-racking and leave you wondering if you threw money into a dark abyss. Be clear about your communication requirements. Make sure your litigation services company will be as involved or uninvolved as you need. Look for a litigation services company willing to build a partnership and can effectively provide you with everything to get the job done right. From court reporting, legal videography, and interpretation services to document review attorneys and alternative dispute resolutions, Discovery offers a host of services that will alleviate your workload so you can focus on your case. Often, you will need more than one-off solutions. Why bother vetting and hiring individuals from a wide range of companies when you can have it handled by one? Deal with fewer people, streamline communications, and know you’re getting the highest quality for every service you need. Up to date Technology, and how to utilize it for your convenience not to enslave you to your devices. Discovery Litigation Services will provide you the court reporter, videographer, set up the high definition audio/video streaming, provide the Interpreter, a Document Review Attorney, Paralegals, Project Managers, Translators, Coders, pre-trial strategy, create the exhibit database, edit your video clips and load all data into a ready to go solution. In the end, we need to put our money where it will have the most impact. It is important to utilize those court reporter firms who can add value, increase quality and decrease your overall workload, and not become another person to babysit and manage. Make sure you are hiring a company who can utilize technology in a way that helps you overcome obstacles and get work done faster than you would without them. We are all limited by time and have too much to do. Invest in maximizing your nonrenewable resources, so you can spend them on those you love and the things that are the most important.